On July 8 2015, Feeding the Accelerator, the USA Pavilion Innovation program at the World’s Fair in Milan, Expo 2015, was inaugurated by the commissioner general of the USA Pavilion, Ambassador Douglas T. Hickey, and in presence of the USA Ambassador in Rome, John R. Phillips. Feeding the Accelerator aims to investigate the possibilities of the World’s Fair as a tool for innovation in our time. At the core is a Business Accelerator with ten carefully selected entrepreneurial teams, each addressing, from different needs, the future of food and the food industry, as a connected but separate program for the public pavilion at Milan’s Expo 2015. More than a traditional business accelerator, Feeding the Accelerator is a group show exhibiting innovative directions as they are being developed, both feeding from and contributing to the rich context of EXPO 2015 — Feeding the Planet – Energy for Life. During the month of September the teams have been working on location in Milan, and on September 30 they are presenting the current state of their companies at the USA Pavilion, pitching to investors and evaluated by a jury led by Ambassador Douglas T. Hickey. After the Expo these companies will continue to develop. Maybe one or two or all of them will end up as large corporations. Who knows? World’s Fairs have, ever since 1851 when The Great Exhibition opened in London, been a driving force for our ideas on the possibilities of the future. The World’s Fairs have been key to developing our notion not only on innovation, but also how we perceive the world around us, and the way we speak, write and think and present the world – on how we communicate and transmit information about the objects and structures that we have around us. The World’s Fairs were invented as a tool to inform people about the innovations coming out of the industrial revolution. But what are their possibilities in a post-industrial world? How could the legacy of the World’s Fair possibly be brought forward in 2015? Why is a business accelerator in the innovation program of the USA Pavilion the World’s Fair group show in 2015? The future has approached modern life as reality on display. 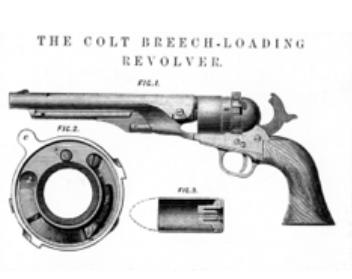 When, in 1851, The Colt, The Breech Loading Revolver, was part of the USA contribution to The Great Exhibition in London’s Hyde Park, people were able to look, with their very own eyes, at the gun of the future. 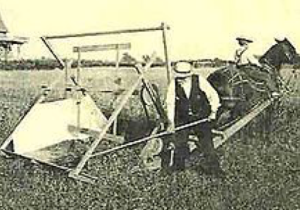 Same with Cyrus McGormick’s Reaper that was exhibited just beside it – it was the future of farming, right then, right there. 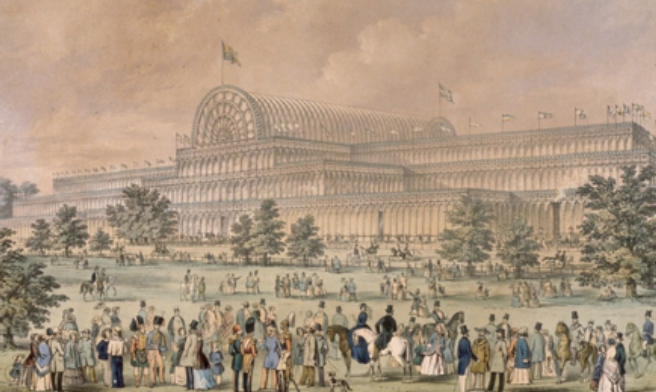 Entering the glass construction – The Crystal Palace – designed by Joseph Paxton with engineer Charles Fox was simply to enter an immense spectacle for the eye, where one could look at the innovations that were about to transform the world. Under one single roof The Works of Industry of All Nations were on simultaneous, spectacular display. They were all there, the objects of the future, each for a specific purpose, invented by solitary inventors, engineers and entrepreneurs – not yet transformed into the big corporations they were soon to be. The Great Exhibition was the great exhibition, the exhibition that would transform the very idea of exhibitions, manifesting industrialism, then as promising as tech in the year 1999. It was an exhibition of very hard facts: technology, industry, functionality – of spinning wheels and pumping engines. It was as far from an art exhibition – of dusty academies, allegories, and hidden, depicted messages – as one could ever get. The sensation was the factuality: the new reality coming through the items that would affect the new everyday life of the new urban masses – simply, things that would be used. The objects on display were therefore not just objects, they were manifestations of a new world order, disrupting every idea of society that had hitherto been known. The real was the magic. The objects put an end to the old world, to aristocracy’s control of land, feudal regimes and the power of the church. Now it was time for the breakthrough of the New – of industry, democracy and urbanism. The objects exhibited made everything – be it money, entrepreneurs, social clashes, art or a new political order – legitimate. The exhibition was even an initiative by the husband of Queen Victoria herself, Prince Albert, and his friends – thus sanctioned from highest authority. So the objects on display were very real indeed, but also much more, they were the tools to make the shift. The success was immediate. Everyone came. The cultural elite came. Charles Dickens was there. Alfred Tennyson was there. Even Charlotte Brontë was there. It created a buzz of such proportions that everyone had to go. Money poured in. The surplus from entry fees funded no less than three new London museums, including The Victoria and Albert Museum. The educational trust that was started still provides grants and scholarships for industrial research in England. glass building that the old world could never ever have pulled off, transparent and shiny and yet based on the knowledge of the future – it was pure magic that it could hold together and contain exhibitions from 28 countries. So, yes, it was grand. birth of the modern, or even post-modern, idea of an exhibition. The Great Exhibition was, to use a word from contemporary art, the first modern large scale installation. In 1851, art was still struggling to depart from the old world. The institutional frames were still there and within them the narrative stories, the allegories, the subject matter rather than subjective style. Art was exhibited at the Salons, and the clever art critics, like Charles Baudelaire, saw – as he did in his famous review from 1845 – that the Salons more than anything were social spectacles for the bourgeoisie to look at each other rather than at the art works (don’t we know the story…?). Hundreds of paintings filling rooms from floor to ceiling. The idea of space or the spectators as part of the artwork was not yet born within art. But they were at The Great Exhibition. It is therefore only logical that the next World’s Fair – held in Paris only four years later – became the launch of the new art, of Realism. The World’s Fair itself was again commissioned from the top, by emperor Napoleon III. The aim was to manifest the superiority of French industry and culture, through an Exposition Universelle des produits de l’Agriculture, de l’Industrie et des Beaux-Arts. A Palais de l’Industrie was built by Champs-Élysées, on the same location where the Grand Palais is located today. But even though the Palais de l’Industrie created magic through the industrial objects on display it never reached quite the same buzz as The Crystal Palace did in London. It was too hot in there, too expensive to build and the construction turned out to be difficult to pull together. On the inauguration day the exhibition could not open in its entirety – and the arts had already been moved to a temporary building a couple of blocks away, on Avenue Montaigne, the street par preference of luxury brands today. It was again grand, but apart from the classification of Bordeaux wines (the one that still holds today), the exhibition that really made it to the history books was the off-off exhibition. It took place in a small gallery beside the Palais de l’Industrie, not displaying industrial objects, but one single painting. Not that it attracted a big crowd back then, but the painter Eugène Delacroix wrote about it and Édouard Manet was clearly influenced by it. It was to become a legend. art that depicted reality as it was, a clean break with academic stiffness, symbols, allegories and narratives. And what could be a more suitable context to launch it than the World’s Fair, the first one after the famous game-changer, The Great Exhibition? No less than eleven of Courbet’s paintings were accepted by the official exhibition. But the painting he considered to be his most important was rejected, and that gave him the window of opportunity. Courbet rented his own venue, paid for it from his own pocket together with his art collector, Alfred Bruyas – to exhibit one single painting. And so it happened that the 1855 Paris World’s Fair not only launched Realism, but also debuted the gallery installation – a one painting only show in a gallery for a very specific context and message. Courbet wanted to the spread the news, globally, to the more than five million visitors that came to see the World’s Fair. 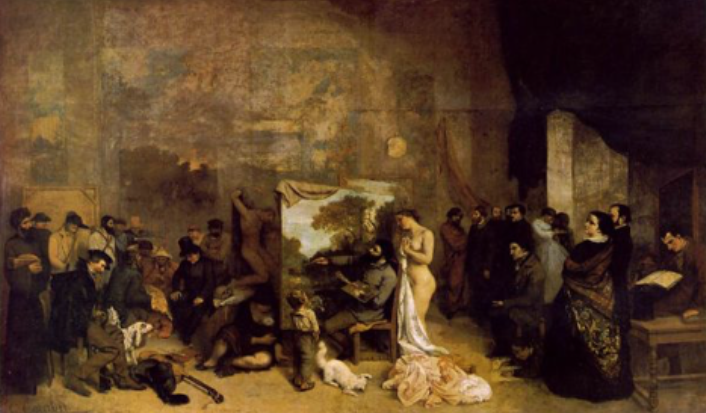 Courbet named the painting A Real Allegory of a Seven Year Phase in my Artistic (and Moral) Life (it is mostly known as The Artist’s Studio), which was the provocation. He presented a real allegory, not an allegory as the academic ones, unreal, hidden, without connection to reality: spot on, like a novel by Balzac, a poem by Baudelaire – or a Great Exhibition in London. In the center is the artist himself, by his easel. On his side is a naked lady looking at the painting on the easel from behind the artist, passively glancing at the image taking shape in front of her. No one sees her, even though she is buck-naked. She is the old academic art. To the left side of the artist are the ones that could end up on the canvases of the new art: the farmers, the workers, the peasants, the priests, the prostitutes, ”real” figures from all levels of society. To the right side of the artist are those that along with him are shaping this new society of machines and manifestos. At the very edge, sitting on a table, the poet Charles Baudelaire, beside him writer Georges Sand, the anarchist theorist Pierre-Joseph Proudhon, and the art-critic Champfleury, amongst others. This off-off installation in Pairs in 1855 is simply a major moment in art history. This is the moment when art became modern. This is when art left the academies to search for reality and relevance. This is the beginning of what was to follow, art with the aim to capture the truth of the eye and the possibilities of the canvas: Impressionism (the reaction but also the following of Realism), Cubism, Fauvism, Suprematism, Surrealism, Futurism – you name it, all the way to Pop and, almost too obvious, Pop’s European counterpart, Nouveau Realism. All these -isms were just different takes on how to look at the world and depict reality in a more real way – a ping-pong game between depicting the real reality of art and the real reality of life outside art. And the starting tool was the World’s Fair. There is also Marcel Duchamp. 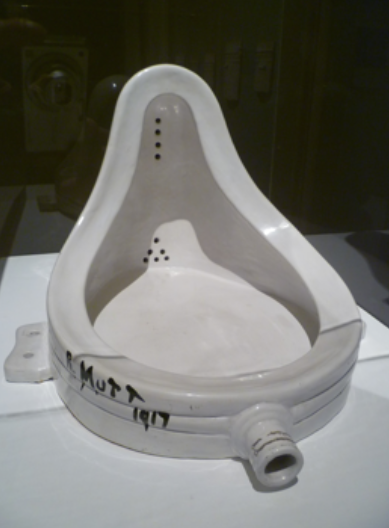 Duchamp was soon, in the 1910’s, to transform art once again, by suggesting that a manufactured product, such as those exhibited in London in 1851, could, in fact, be art. After having made a buzz in his early twenties, twisting Cubism in a new direction (and being rejected), he went the opposite direction from Courbet. He took the boat to New York where he felt more at ease, not having to compete with Braque, Picasso, and the omnipresent pressure of Gertrude Stein’s Salon, demanding new directions of abstract art every week. By transforming himself into a chess-playing enigma, Marcel Duchamp created his own and very long lasting buzz. He took on a search for art beyond paintings, beyond the seemingly mass- produced, look-alike, stereotype abstract canvases, painted by an ever growing group of artists – a factory in its own right – that all marketed their own individuality and ingenuity, but in fact were close to replicas of each other (the same beret, the same red wine, the same claims, the same format of expression). sto ol by an artist who silently proposed that this could be an art piece. But – and here is the clue – what Marcel Duchamp proposed was, in fact, not about the object itself. No, he made a structural move, to a new notion on knowledge production, and a very simple one indeed, so simple that nobody had thought about it: that an artwork carries no magic if no one looks at it. Art can only be created through an interplay between the artist, the spectator – and the object. Marcel Duchamp was raised in the era of the large industrial exhibitions. He was exposed to them as there were several of them only in Paris in his youth. He was extremely interested in the reality outside of art, and of the consequences of industrialism. He spent several years working on optical instruments and applied for a patent from The Seine Department’s Business Court for his Rotoreliefs. He even rented a booth at the Concours Lépine, the innovation fair in Paris, in 1935. So, what is really at stake? In 1851 the manufactured object turned magic, a tool to tell the story of the bright and shiny future of the industrial revolution. Visible, tangible innovations, to solve one problem each, were put on display at large industrial exhibitions that became vehicles to let the new urban population experience the powers of progress and technology, the powers that would disrupt old structures and build a new societal machinery. In 1855 Courbet claimed artists were to put on display the new reality created by the machinery behind the new objects, those of the industrial revolution, in order for art to be relevant. He launched a view on art that would last for more than a hundred years – an art dedicated to the representation of reality, to put on display – on canvases – the visible reality of this new world. 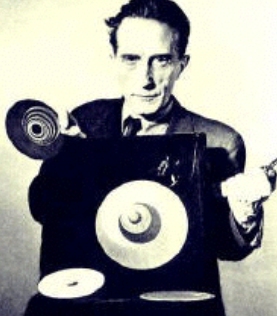 As a side-step, in 1913, comes Marcel Duchamp, displaying manufactured objects, those that were not art, but real and functional – only to draw attention to the idea that all meaning occurs through an interplay between object, sender and receiver, suggesting to approach the reality of things through interaction, possibly as complex as human perception, as complex as nature. The entire scope of the late 19th century until today is thereby set: from the singularity and mass production of industrialism to the possible complexity of a connected, networked society. From eye and machine to interactivity and operational systems. Duchamp was of course way before his time, and he would silently play chess, work on his secret last piece and wait another 50 years until the world discovered his ideas and he would quickly turn into the most influential artist of the 20th century. But the wheels – or, rather, the engines – of industrialism had just started in the 1910’s, as had the industrial exhibitions. Industrial principles were applied, separately, in each sector of society. The scale of what was put on display grew with the scope of those industrial systems, as did the need of the industrial exhibitions as tools for communication, to generate belief in the same future. 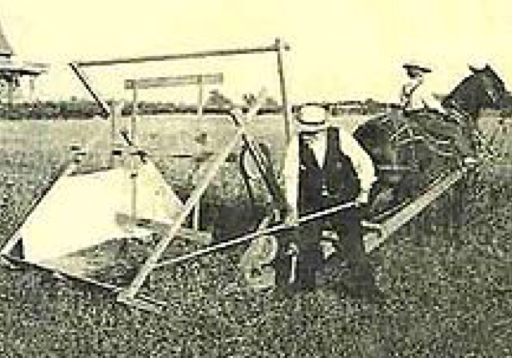 If, in the late 1800’s, the industrial exhibitions were putting on display the new objects of the industrial revolution – machines, engines, manufactured objects – the industrial exhibitions in the early 20th century displayed the next level: the prototypes of the entire industrial society, innovations on a very large scale. And of course those were a feast for the eye as well. People would now come and look at – and experience with their very own eyes – the physical nature of a modern society in the making. This was a broad societal offspring of what had been introduced by the avant-garde, like Bauhaus in Germany and De Stilj in Holland, introducing the modern, functional design with a new society in mind – freed from the ornaments of an old handicraft-driven bourgeoisie. It changed the production systems on all levels. Just take the country that I was born in, Sweden. The Stockholm exhibition 1930 was not a World’s Fair, but it shaped an entire nation, if not region. It was the prototype and the launch of the Welfare State or The Swedish Model. It created a social, political and democratic model that would last for decades and it is still, in international surveys, claimed to be the strongest brand of the country, beating H&M, Spotify, Ikea, Minecraft and ABBA. In 1930 there was an urgent need to re-shape the political system in Sweden, not least after the 1929 Great Depression. A group of young architects, designers and intellectuals played the role of the classic avant-garde and made the theoretical framework as well as the design. The government and a few financial families put up the money. With Gunnar Asplund as the main architect, an entire prototype city was built, not as architecture but as a container of the whole scope of a new social order – presenting prototype solutions on everything from housing to institutions within education and healthcare – addressing new solutions for issues on politics, social questions, and gender issues. The impact was similar to that of The Great Exhibition in 1851. The sensation of progress on display was something to sell. It made people gather around an idea, a vision, a future. People came. They had opinions. Change was initiated. But what happens when difficulties of immense scale start to occur as a parallel track? To stay relevant after the Second World War, the World’s Fairs had no choice but to exhibit something even larger than societal machines: outer space. The first World’s Fair after the war was held in Brussels in 1958. 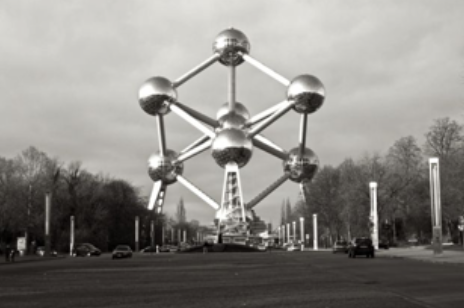 It was shaped around a large construction that is still a tourist attraction in Brussels, Atomium. Blown up in scale and built in iron crystal, a model of something very small – a unit cell – was meant to generate the feeling of space, of a future beyond the wars of the worlds. Atomium would get its American equivalent four years later, through the Seattle World’s Fair, and its center piece,The Space Needle – at the time the tallest building on the Western side of the Mississippi River. But back on planet Earth things were really in rapid change. And this time it was neither machines, nor the engines of prosperous progress that was the topic of the day. What was really on display, in the media (which had taken the place of the World’s Fair as a source of information) there was something much larger going on than any exhibition ever could handle: the social consequence of the industrial revolution and its new middle-class. There was suddenly youth culture. There were new wars. There were The Beatles, The Stones, and Bob Dylan. There were tumbling dices and strawberry fields. It was all over now, Baby Blue. Peace Through Understanding. But Robert Moses, famous for being the mastermind of modern New York City, now the president of the World’s Fair Corporation, did not get along with the official World’s Fair organization. They simply did not approve of his version of a World’s Fair. So it became New York City’s own version. The Philippe Johnson designed pavilion for New York State was a forecast of what was to come. Andy Warhol was asked to contribute and proposed a large mural – America’s 13 Most Wanted Men, influenced, again to no surprise, by a work by Marcel Duchamp from 1923, Wanted, $ 2000 Reward. When asked to remove the thirteen portraits Warhol suggested replacing them with 25 portraits of Robert Moses. Just before the opening Warhol agreed to paint the portraits over with silver paint, the color in his Factory, and, also the color of space. 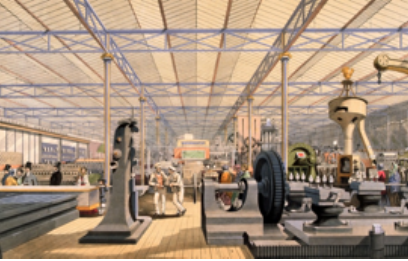 This was clearly no longer the same world that celebrated Prince Albert’s exhibition in 1851 – of pumping engines, innovative machines, bright new objects and progress on display. This was no longer a world of The Works of Industry of all Nations. After the Osaka World’s Fair in 1970 there would be a long and silent gap, a void of 22 years, until the first post-industrial World’s Fair, Expo 92 in Seville, Spain, opened. If the industrial exhibition until 1970 had been forerunners, changing the modes of the exhibition formats, creating relevance through concrete content and expanding into ever-larger territories – the world was now moving beyond the sensation of industry. Expo 92 invented a new format, to bring in inspiration from the world outside of the World’s Fair – from Disneyland. Expo 92 celebrated the 500th anniversary of Columbus’ discovery of the Americas – in the format of a gigantic theme park, and with a mission to solve the global water issues. Instead of rollercoasters, merry-go-rounds and scary monsters, the ”rides” were national promotional tours executed by no less than 108 nations, and sponsored by the larger corporations of each nation. 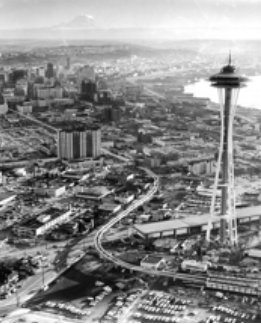 The post-industrial World’s Fair had turned into a two-fold package. 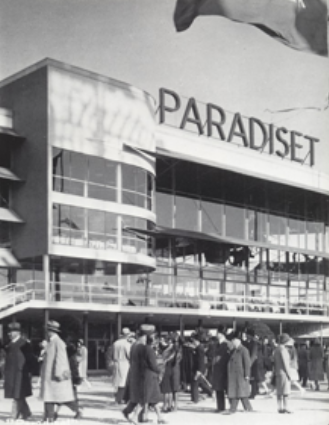 If in the early days the World’s Fairs were hard-core and evoked sensations (and even provocations) – the aim now was to make an exhibition that would please and attract the very wide scope of visitors needed, primarily families. 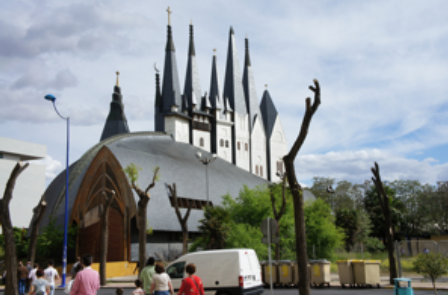 And, some 41 million people did come to visit and take part of the ambitious cultural program in Seville, including a series of concerts with the world’s most famous guitarists, from BB King to Paco de Lucia. Behind the scenes, hidden, was the second part – the non-exhibited meetings, summits and negotiations on diplomacy, of such political importance (including top politicians, scientists and corporate leaders), that they had to take place behind closed doors. Useful on that diplomacy level and a new role for a World’s Fair, but what was not there was that thing which created the magic for the masses in the old days: that spark of the coming, of a future, a not-known – the inventors innovating, the designers designing, the entrepreneurs entrepreneuring, artists developing, prototype builders prototyping. To cut a long story short, in Lisbon in 1998, in Hannover in 2000, in Shanghai in 2010 the Expo 92 of Seville formula was to continue. 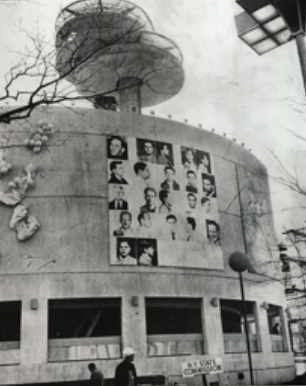 With a focus on national branding the World’s Fairs became tourist attractions with content, for families, for corporate tours, for school classes, with entertainment of various kinds – and, with global diplomacy discussions behind the scenes. In a world where cities and regions are gaining importance over nations, the World’s Fairs of the post-industrial era have been turned into attractors to manifest a city or a region. That was very much the case in the post-Franco Seville and even more so in Shanghai. Millions of Chinese came to see a world on international national promotional display, just like in Europe in the late 1800’s. But that magic of the exhibition format, that magic of The Colt from 1851, or that of the societal machines in the early 20th century, where was it to be found? In the same year as the large structures turned the World’s Fair into a theme park in Seville, something very different happened in art. A young Thai artist, Rirkrit Tiravanija, decided to, as his art piece, serve noodle soup smack in the middle of the Arsenale exhibition at the Venice Biennale. Visitors passing by were kindly invited to come and taste a bowl of soup, chat with the artist as well as with other visitors. They did. The noodle soup became the talk of the town in Venice that year. It seemed to be much more intriguing to sit with this smiling, thinking guy, eat noodle soup and have conversations about art, food, the biennale, life, whatever – much more so than to look at all the so-called installations and objects that were on display around him. Rirkrit Tiravanija introduced something new that simply felt very relevant – and even more, it was clear that the artist himself knew what he was doing and why he was doing it. This was not an art that depicted reality, but instead built a system of conversations, ideas and topics where the artist’s presence was the initiating spark, fueled by a bowl of soup. Right then and right there Rirkrit Tiravanija initiated what was to be called Relational Esthetics, a label (pinned by curator Nicolas Bourriaud in 1998) that describes how art transformed itself during the 1990’s, from object to interaction. What happened was clearly related to Marcel Duchamp’s Readymade – but, as Tiravanija himself said in a recent conversation with Daniel Birnbaum in Log Magazine, no. 34 – what he really did was to ”put the urinal back on the wall – and use it”. Just as the manufactured object wasn’t the key for Marcel Duchamp, the soup wasn’t either for Tiravanija. He moved art one step further, proposing something other that the fixed, stable installation art, something other than the idea of display, away from representation and one-handed dialogue, and, silently adding a step beyond even Marcel Duchamp. It was as if the art world was ready for an interchange, where the spectator would no longer be a spectator, but rather a participator, directly engaged in the experience and making it his or hers, generating connections rather than different points of view. Art reintroduced human interaction, relations, something more natural and even more relaxed than the one-way messages of the old art. It was meaning appearing through dialogue, through interchange – and, why not? – open source. Of course Rirkrit Tiravanija was not alone. Carsten Höller works with different tools but shares the same line of interest. He has been turning museums into artist-driven theme parks about human perception – as he did at Tate Modern and Hayward Gallery in London, or the New Museum in New York. 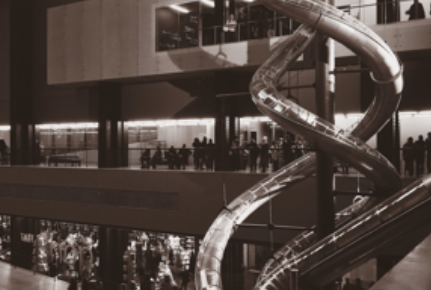 The spectators have even been invited to ride ”slides” through entire museums, putting themselves on display, while having a personal experience. Armory in New York, explore related journeys, creating environments that generate an intrinsic interplay with the spectators movements and instant experiences, linking back, again, to what Duchamp was searching for: an art beyond the fixed object and idea of art, something grasping as complex and, again, as natural as human perception. In 2015 a Business Accelerator is the World’s Fair’s group show at Milan’s Expo 2015. So, that is the story. It was with these conditions and with this background that the task to produce an innovation program for the USA Pavilion at the Milan’s World’s Fair, Expo 2015 was approached. It all started through a conversation with Dorothy Hamilton on the future of the chef – and before we knew it Mitchell Davis joined the conversation and the USA Pavilion asked us to produce an innovation program. And we (myself, Savinien Caracostea and Johan Jörgensen) had to answer. The first thing we knew was that innovation results on display was not enough. Today the already launched innovations are already available, information on them can gathered in a few seconds, and it is really no point in putting them on display. No, we needed to generate our own Noodle Soup, a systems of conversations, ideas and topics to would generate innovation but also an understanding of the complexity of things. We had to start from the context, from the first ever World’s Fair with the future of food on the agenda: Milan’s Expo 2015, Feeding the Planet/Energy for Life, and generation innovation on location, in real time. Then, what were the conditions? the same force as the industrial one once did. Just like industrialism had come pretty far in 1851 so has internet technology in 2015. It has already generated the world’s largest corporations. It has already generated the new barons. And it has generated enormous change – the internet crosses per se boundaries and nations, as well as disciplines and genres, and enters every little part of society and business genre, it connects the individual with the entire world. Soup: connections, re-connections, relations, open source; it has become as complex as human perception, as nature. Information technology gathers information and makes something out of that very information – developing an already existing system So to its very nature the technology of our times is, as much it is a novelty, most of all tools to move away from mechanical technology – to re-think, re-interpret, re-discover and re-cycle already existing systems, sometimes very old, even forgotten knowledge. It is to structure an information overload and make something more efficient out of it. But, even if the digital devises are visible, the innovation systems behind these devises are not so easy to put on display. We needed to exhibit the change of systems, of structures. Food is the theme of Milan’s World’s Fair, Expo 2015. And, in fact, that changes everything. Food is the perfect starting point for an investigation on the conditions on planet Earth today, as it relates to each and everyone of us, it is in our bodies and in our brains. Food is ideal to understand on how technology is entering and disrupting every part of society, to re-establish lost connections. Food is simply everything and everywhere. Food, shelter and clothes are our basic human needs – food is the largest singular economy in the world, three times as big as the second one, the global energy industry. And, most importantly, food is probably the one, single industry that was the most mis-matched to industrialism. Food and industry do not go well together; the basic principle of industrialism was to de-nature, to generate large scale production, food is somehow nature. But information and food does work well together. 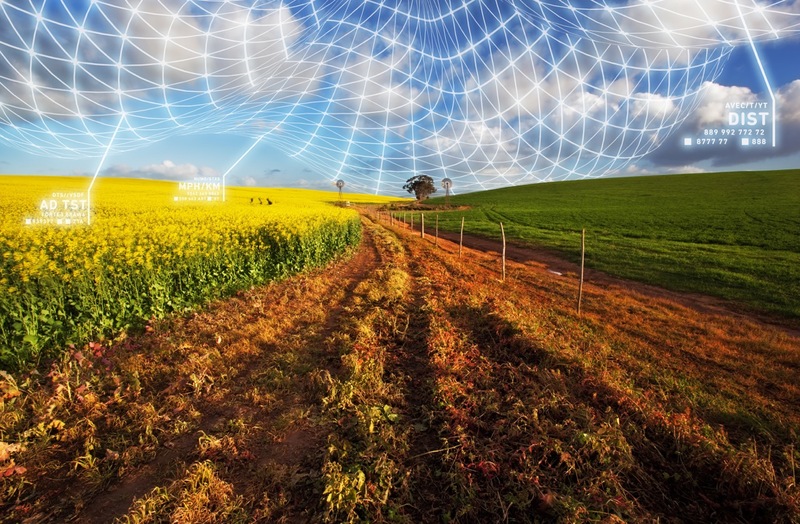 By collecting and handling data on produce, on our behavior, on where things are and could be transported to it is possible to predict and make decisions that can make the food systems both more sustainable, smart and natural. And the time is right. Food is the cultural expression of our times, it is what art, poetry, cinema and theater used to be. Today it’s chefs like René Redzepi, David Chang and Alex Atalá that end up on the cover of Time Magazine, not artists or poets. It is food and not cinema the connoisseurs we stand in line for in the large cities. 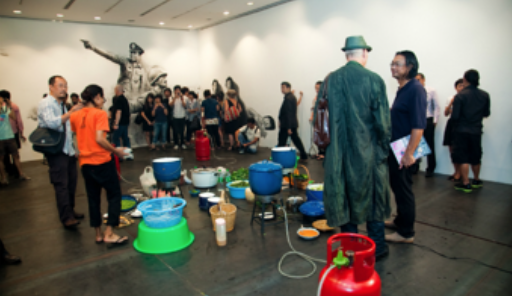 It was simply not by chance that Rirkrit Tiravanija used food as his tool in the early 1990’s; food is versatile and has the capability to capture that Now that an object, a painting or any depiction can ever achieve. And even more, food is the most posted item on social media, and, food is what we talk about. Food is health, food is body, food is obesity and the most crucial element on how we will live our lives. Food is knowledge. Food is information. Industrialism was efficient in finding large scale solutions to large scale problems when the Western world was urbanized back when The Great Exhibition was applauded. But now we have to face and solve the backside of that very industrialism: the troublesome effects on our global environment, climate change, obesity, poverty, pollution – the de- naturalization and de-humanization of things. It really comes down to the absurdity of the current business models, those that make it natural to send a tomato all around the world, back and forth, to end up in the local grocery store where it was once produced. Or that the business model of industrialism made us eat more sugar than is necessary, with obesity as a problem in one part of the world as a consequence and poverty as a problem in other parts of the world. When the British chef Fergus Henderson in the 1990’s introduced ”nose-to-tail cooking” he nailed the problem. He re-introduced and re-interpreted knowledge – to use and understand the possibilities of The Whole Beast – that was common to everyone before the industrial revolution. But the factory model threw that knowledge on the bin – to de-nature food and make us eat either the filet of beef, for feasts, or ground meat or hot dogs for everyday eating. We lost, if ever for a very brief moment in the history of the planet, knowledge as old as humanity. re-use that which we already have. It is happening. And it is happening fast. Airbnb introduces homes as hotel rooms, Über cars as taxis, and on it goes. But there is no better area to re-discover as food. The most important effect of information technology and of big data (that we have information on movements, where we are, where things are, on behavior and what not) does one very interesting thing: it re-connects pre-industrial knowledge with post-industrial systems. 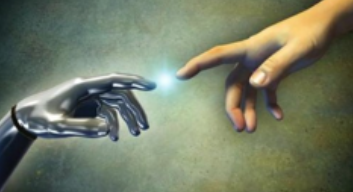 The new technology brings us back to the soil and nature of being a human being in a global society. The USA Pavilion is nicknamed ”The Whale”. It differs from most other pavilions. The architecture manifests something as simple as evident: it is open and inclusive. You do not have to stand in line to get in. The main floor is a board walk where the president himself greet the visitor followed by different points of information. You walk around freely and create your own narrative, contrary to most other pavilions with long lines to get in and with already defined narratives once you are in there. But even more, the USA Pavilion is much more than the USA pavilion. The pavilion is the mothership with a series of connected projects and events, some inside the pavilion, others in the city of Milan. There are dinners served by no less than some 60 of the greatest contemporary American chefs at the James Beard American Restaurants in the city. There are talks and conferences at the Casa America in downtown Milan. And – there is the Innovation program, connected to and commissioned by the USA Pavilion, but operating independently, as a parallel program, from the offices of Copernico, just behind the Centrale in Milan’s city center. With this set-up the USA Pavilion introduces a new and unique structure for a World’s Fair, taking the post-industrial World’s Fair to the next level. The two-fold package of Seville in 1992 – a theme park pavilion for the public and diplomacy discussions behind closed doors – has been transformed into an open and inclusive, complex and dynamic system of connected projects, conversations, ideas and topics with the pavilion as the initiating spark. It is a system that allows for innovation happening in the present, the initiate that spark of the future, whatever that may be. It was obvious: we had to reach out and see what the innovators were actually innovating, what was happening out there. We knew there was a big buzz about food and tech and the need for change, but what was really happening? The first pre-condition was to move what we discovered to the context of the World’s Fair in Milan. We had to reach out and find the teams that were innovative, working on changing the systems and structures that would have an effect on the way we eat and produce food in a near future. We understood very quickly that we had to exhibit – to put on display – a wider scope on the innovation models of today. Parallel to carefully selecting ten emerging companies to accelerate, each with a different take on the future of food, we started interviewing people about innovation, mentorship and the needs in today’s society, through the interview series Mentor Minds. We felt a strong need to extend the open and inclusive features of the USA Pavilion, to make way for teams from different countries and contexts to participate. 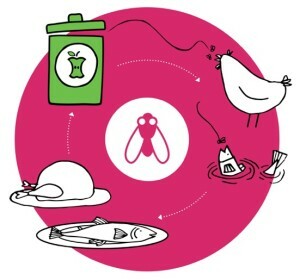 We began setting up a system ourselves, Feeding the Accelerator, to feed, execute and discover contemporary innovation within food, so that entrepreneurs would be able to really take advantage of the unique context of the first World’s Fair in food. More than a traditional business accelerator, it is a group show exhibiting innovative directions as they are being developed, both feeding from and contributing to the rich context of EXPO 2015 — “Feeding the Planet – Energy for Life”. Feeding the Accelerator connects selected entrepreneurial teams which have unique ambitions to develop new possibilities in areas including farming, food distribution, nutrition, community building, and knowledge sharing to the experience and infrastructures of the partnering companies of the USA Pavilion. By providing mentorship from leading industry professionals, as well as chefs, artists, designers and theorists to big corporate structures and start-ups alike, Feeding the Accelerator creates synergies between an entire ecosystem of disciplines around food. And, coming near the end of the 2015 World’s Fair as well as that of the innovation program, it is even more evident now than when we began that the entrepreneurial teams in Feeding the Accelerator are dealing with complex systems, transforming data and ideas to bring us back to food’s real potential. Disrupting systems means to change what is already out there and make it better, smarter, more efficient. So apart from just making business (like in the old, industrial system), there are many other layers that each company is addressing: social issues, environmental issues, consumer dialogues, legal issues – simply covering the whole beast of a contemporary, connected, global society. The need for change and to enhance innovation is an equal concern to all partners. That is also why the entrepreneurial teams have been put in close contact with the official partners of the USA Pavilion Innovation program, not least Microsoft that has been involved on a daily basis. The big corporations are also in constant transformation. And through the dialogue with these entrepreneurial teams, their edge quality is put in contact with the large structures, providing possibilities for mutual exchange, sharing knowledge and ideas, generating that Noodle soup situation we strived for. As the world’s population is moving to urban areas and as the industrial systems of separate production (food produced in one place and transported, sometimes around the globe) are being disrupted, the models of city innovation of today are in rapid and necessary change. Kalulu is to the fruit and vegetable industry what Airbnb is to the hotel industry and Über to the taxi industry. Using extreme competence in transforming data, they deliver information to reconnect a direct link between farmer and consumer, giving the profit to the one that actually does the job, the farmer, and making the local produce stay local. 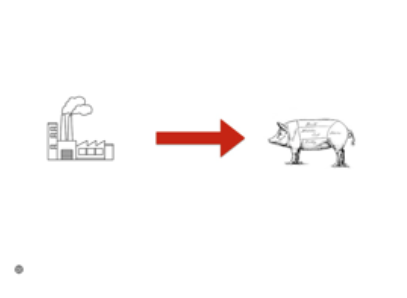 FoodTrace is in a similar way handling information to re-connect local production with local stores, re-connecting the actors in the food system, generating a new system for business to business discovery. With IceDreams, ice cream is used as Duchamp used the manufactured object, taking something very common – ice cream – and treating it in a new way, putting it in contact with current technical, business and communication possibilities. IceDreams shows that ice cream can be a tool to health instead of obesity. The artisan skills are codified to match techs striving for a structural change. Cookbooth is creating the world’s largest creative archive of food, for foodies and chefs, to reveal creative processes, promoting better food. This is a user driven platform to structure knowledge about food and to structure knowledge of professional, sustainable cooking. Mintscraps has a patent to reveal hidden information about waste in kitchens, leading to more informed decisions, and, generating a better and more sustainable supply chain. Information system that creates substantial savings for the users and a more sustainable planet. The Colt was in 1851, storytellers of what is to come. 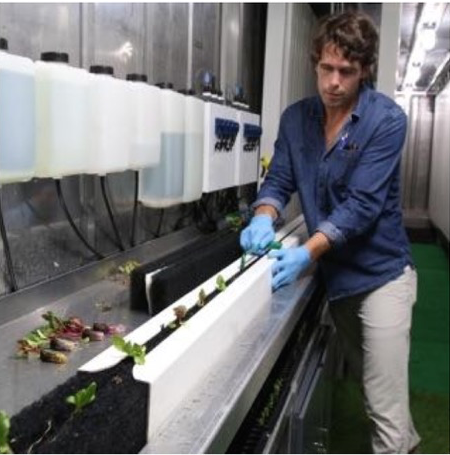 It might be that some of them will be the Google or Apple of the future food industry. Maybe not, they are still in the making. And this is completely beside the point. Working with them intensely in Milan in September and prior to that online, they do carry all the potential that is needed to discuss the future of food as well as that of innovation. The teams of Feeding the Accelerator all address the whole beast of society. They all use information technology and data to disrupt the mechanisms of the industrial society, and make way for a post-industrial world where we no longer throw ancient knowledge in the bin. The central topic of the World’s Fair in Milan is to discuss and find ways on how we will be able to feed a global population of 9 billion people in 2050. The USA Pavilion has been structured not just to present results for the present, but to take things one step further, towards a near future. This is to set a legacy, and one that needs to continue, in different ways. 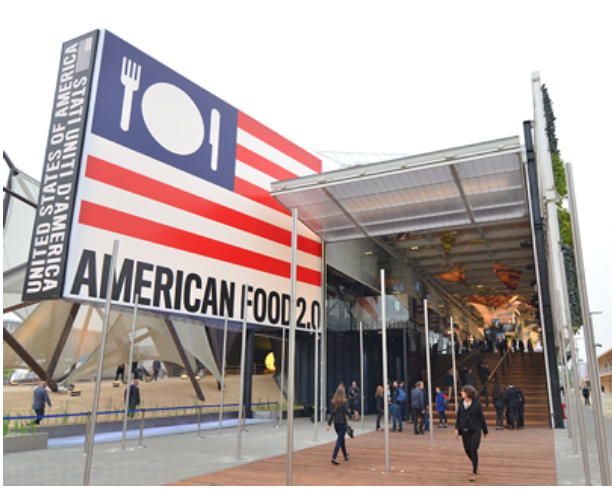 By setting up an innovation program connected but separate from the Expo, the USA Pavilion makes way not only to discuss the American Food 2.0, but also of the World’s Fairs’ possible 2.0’s. It is a starting point. And one that carries a responsibility.